The flow of water around the structure of your pool cage can be one of the primary factors in the longevity of it. The experts at Tampa Bay Rescreens and Repair have taken the time to put together some tips for you to not only make the flow of moisture more efficient, but to also save you money in costly repairs. When it comes to the installation and maintenance of Pool Enclosures, the motto of “quality work at a fair price” is lived up to every time. Over time, your pool cage will be subject to tens of thousands of gallons of rainwater passing through it. This has several effects. Pool Enclosure Super Gutters too small? Is your pool enclosure gutter system properly handling the amount of rain flowing off your roof, especially barrel tile roofs? Water overflowing over the gutter will cause your fascia and soffitt boards to stay wet, inviting insect infestation and wood rot. If the super gutter wasn’t attached to a structural part of the roof framing the rotting fascia board could cause the gutter and the screen roof beams to collapse with catastrophic results. 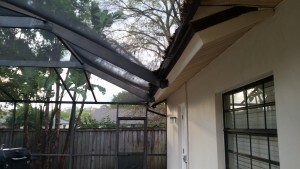 Tampa Bay Rescreens can replace that 5″ gutter to a 7″ super gutter allowing the gutter system to handle the roof rain run off. With a Super Gutter, the effects of rainwater can be mitigated, which will greatly decrease the damage by the elements and extend the life of your pool cage. Is your pool enclosure lacking a Super Gutter altogether? Photo before the installation of a super gutter. Photo after the installation of a Super Gutter. Please consider the installation of a Super Gutter in your existing pool enclosure today to protect your investment and keep your Tampa home looking beautiful. Please schedule an appointment with Tampa Bay Rescreens & Repair services Tampa, St. Petersburg, Clearwater, Dunedin, and Oldsmar areas. Please call us today at 813-679-1074 or you can also contact us using the button below. Marc Hadley founded Tampa Bay Rescreens in 2011 and has over 20 years of experience in the installation and repair of screened-in pools, lanais, and porches. His company slogan is “quality work at a fair price” and he takes great care in looking after you, the customer. Tampa Bay Rescreens & Repair was very fast with the response to my call, and the salesman came and gave me a quote within 2 days. The salesman was polite and very informative. We could not have been happier with our experience and would recommend them to all. TAMPA BAY RESCREENS INSTALLED NEW SCREEN ON MY LANAI . I WAS VERY PLEASED BY THIER CRAFTSMANSHIP AND ATTENTION TO DETAIL. I AM A TRADESMEN AND APPRECIATE THIER PROFESSIONAL WORK. I WOULD RECOMMEND TAMPA BAY RESCREEN TO ANYONE LOOKING FOR SCREEN WORK. Tampa Bay Rescreens & Repair did work at my home. I cannot say enough about how professional this Company handled my job. They are committed to doing a fine job and making sure the Customer comes first. I would recommend them for any job. Tampa bay rescreen and repair where professional and curtious. They arrived on time. Mark and John where fast and clean. I would recommend them to all who want an enjoyable experience with their home repairs. Tampa Bay Rescreen did an excellant job on my lanai. I was happy with the resonse I received after calling them. Their workmanship was very good. I would recommend them to my friends and family. I was very happy with the job they performed. I believe I got what I paid for. A quality job at a fair price. Tampa Bay Rescreening and Repair did an excellant job on my lanai rescreen. Marc and John were on time very clean and curtious. I had them back a couple of weeks later to remove the old metal roof over my lanai and replace it with insulated panels. Again a excellant job. I would recommend them to anyone wanting good clean work at a fair price. Mark and crew were professional, efficient, friendly and effective. With the refurbishment of the screens and roof on our patio and some other work they were able to knock out for us, We are completely satisfied. We look forward to the next job we can have them bid and complete. We recommend Mark and John without reservation or hesitation. Fantastic Job at a very reasonable price. Did more than I asked. Marc and his crew got down to business right waay and were tremendously efficiennt. He explained everything and was very responsive to my needs. i wholeheartedly recommend him. 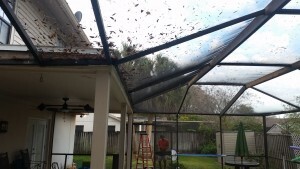 Tampa Bay Rescreens & Repair are very professional, efficient, polite and do a awesome job. I highly recommend Marc and his crew to anyone who wants there screens for there patio and kick plates installed They pressure wash first,then install. Replaced screen door hardware for free. This is Tony and give them a A+++. I was very pleased with the work that Mark, John and their team did on the rescreen of our lanai. They were very timely and professional in their response. Everything they said they would do, THEY DID!!!! Including putting new hardware on the doors and cleaning. I would and have recommended Tampa Bay Rescreens to friends. Excellent Work. John came and gave us an estimate on Saturday 3/28 and the very next Wed 4/1 I had a new screened pool area. I cannot say enough how professional, knowledgeable and courteous John and Marc were throughout the process. I highly recommend these gentlemen for all of your screening needs. On very short notice, John came by my house and capably replaced two panels of screen on my pool cage. I am very appreciative of his prompt service. I live in the UK but own a home in Tampa. I scheduled an estimate with John via email and he responded very quickly. Was in town for a short time and he was able to work his schedule to not only get an estimate done, but also schedule and perform a complete rescreen of our pool deck. He and his team did a fantastic job... Excellent work, thanks for the professionalism and the follow through. Damages done by Hurricane Matthew in Vero Beach? Tampa Bay Rescreens can help! Tampa homeowners use Phifer Screen Material when rescreening their pool cage!